I've received my new shipment of Boston Organics this week - so I thought it might be high-time to give an update on how I used my last shipment. 1 Fair Trade Avocados (Mexico) - I have to be honest - I don't know where this went, but its not in my fridge, so I must have eaten it. I probably put it in a salad. Now I need some tips - I don't go through oranges super quickly - and other than just eating them straight up - I'm at a loss. I did cook some greens with oranges once, and it was delicious. Any other creative ideas for using oranges in recipes? The apple crisps I posted today use some orange juice and orange zest! Other than that, maybe toss some slices or wedges in salads? Hi, nice meeting you last night at Blogtober fest. I like the blog! 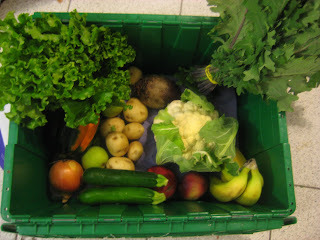 I've been thinking about Boston Organics as well myself - its good to hear what you got from them. Pairing orange and almonds are always great for baked treats, I've done a torte with these before that turned out fantastic! The juice and zest make a great glaze, that I've done for pork and turkey in the past as well. Good luck!